This book describes, the for the amateur astronomer, the scientific processes by which our understanding of planetary nebulae has been derived and explores the way in which the threads of observation and theoretical research have been drawn together to produce our present day picture. The story is not straightforward, however; a variety of other celestial objects can mimic the characteristics of planetary nebulae and many of these interlopers are not only difficult to root out but are also interesting in their own right and these are discussed in a chapter of their own. A major part of the book is devoted to a catalogue of planetary nebulae (1340 objects), with notes about objects of particular interest (24) and finder charts (253) based on photographic sources. The widespread use of large aperture Dobsonian reflectors has brought within reach of the amateur astronomer many objects which only a decade ago would have been considered the sole province of the professional. 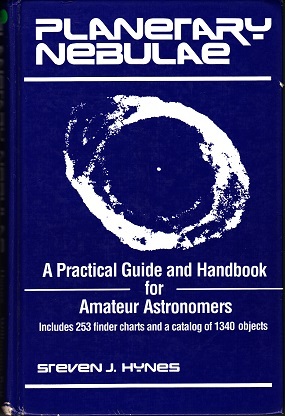 The selection of objects in the finder charts takes account of the ever increasing size of telescopes available to amateurs but also provides for the user of small and medium aperture instruments. In many cases the planetary nebulae are still not well studied and even basic parameters are poorly determined but they represent a challenge to observers. In addition, many references have been provided to enable the advanced astronomer, with access to professional journals, to pursue his research further. The catalogue is essentially a complete listing of known planetary nebulae through mid 1990.